The oldest cultural festival in Croatia, Dubrovnik Summer Festival takes place from 10th July to 25th of August in Dubrovnik presenting rich and vibrant theatre program in the fields of theatre, ballet, classic music and opera. 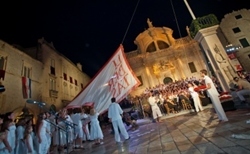 The festival offers 10 outdoor scenes around the beautiful Old Town of Dubrovnik. There will be more than 70 different events in 47 days and again this year it is expected more than 60,000 visitors and approximately 2000 artists will perform. Festival's sales office on Stradun is opened from July 1st, with opening hours from 9 a.m. till 11 p.m. every day. Apart from Stradun, all guests can buy the tickets in Festival's Palace (Od Sigurate 1 street) or online.